Unabridged, historically accurate graphic novel of the Bible with a high view of scripture. This page gives examples of the historic accuracy. Images showing the integration of maps and some of the historical reference material. Nazareth: Drawn from photos and old paintings of the locations. Using the most well respected biblical scholarship available and a range of historical and archaeological sources I have endeavoured to link the events to as specific a time period as possible. I wanted to include as much historical detail as possible also, for example, at the start of the “Judges” period is the Late Bronze age and chariots have four spokes in the wheels, half way through the three centuries the technology moves on and chariot wheels have six spokes and by the end of the book it is in the Iron Age. This level of detail is intended to immerse the reader in the story, contextualise the setting and use a range of styles, fashions and traditions to give a richness that text alone will lack. Another element is the correct ethnicity of the heroes and their enemies, to help understand the spectrum of people found in the Bible. Including people from Mycenaean Greece, Egypt, Arabia, Crete, Anatolia, Babylon, Sardinia, Egypt, Africa and of course Israel. The landscapes in the comic make a beautiful addition as they are drawn from photos of the exact areas where these significant historical events took place. Also, maps interspersed into the story help pinpoint the action geographically. The maps are very interesting because many of the events take place close to other significant places that come out in other parts of the Bible, for example Deborah and Barak's battle takes place in the same valley as Gideon's and they are both overlooked by Nazareth the town where Jesus grew up. "...the historical research taking place for this project is nothing short of seminary-level biblical scholarship"
"I think it will set a new standard for accuracy and fidelity in illustrated presentations of the Bible." - Rev. Dr. Christopher R. Smith (Doctorate in Historical Theology and the Bible.Author of “Understanding the Books of the Bible” Study Guides from IVP and the “Good Question” Blog). 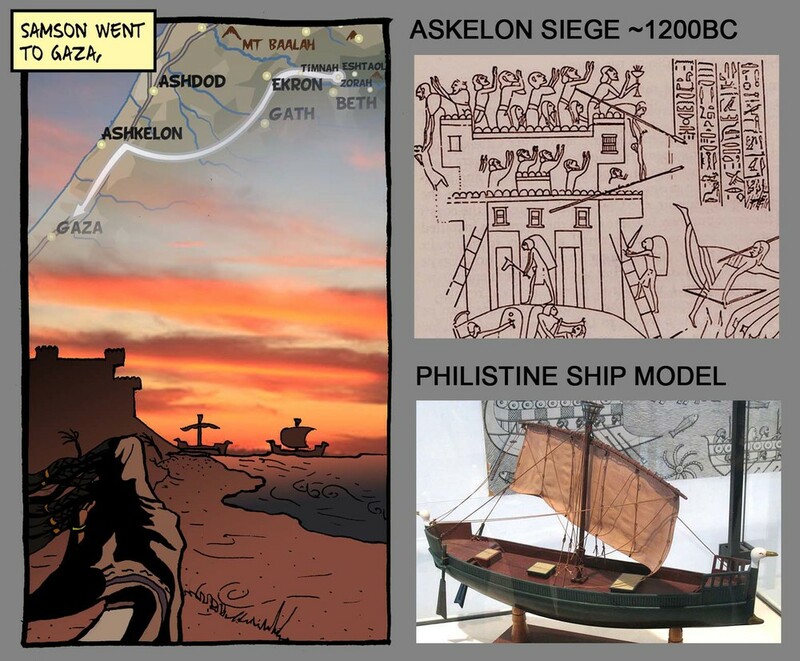 "This comic gives a clear portrayal of the Samson story that enables readers to enter into the experience of Samson"
"As part of drawing the Word for Word Bible Comic, the author has painstakingly studied the history, culture, and geography of the text to make sure his drawings are as accurate as possible."